Department » Austin Water Utility » Programs » Stop the Grease Blob! 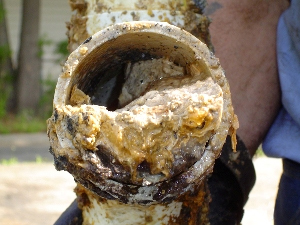 Pouring cooking oil or grease down the drain sticks to the insides of the wastewater pipes, and creates an gooey-gross Grease Blob. The more you feed him the bigger he gets until he causes a monster of a clog. Help stop the Grease Blob from causing expensive repairs, foul odors and sanitary sewer overflows! Collect small quantities of cooking oil or grease in a coffee can, empty milk carton, or similar container (preferably with a lid so it doesn’t pour out); optionally, it can be mixed with kitty litter, and doubled bagged; chill grease in the fridge if you need to get it to harden up. Toss this item in your trash cart, or even better, recycle it at Austin’s Resource Recovery’s Recycle & Reuse Drop-off Center. Put greasy food scraps in the trash…unfortunately, very greasy and oily food cannot be composted. Try not to put greasy food scraps in the garbage disposal. Use a paper towel to wipe grease from pots, pans, plates, and utensils prior to washing. Use a sink strainer to catch food particles. For restaurants, or large quantities of grease, learn about Austin Water’s Grease Trap Program.